Gillette razors for men with stronger-than-steel blades to stay sharper longer (vs. Sensor3). Each razor blade refill is engineered to last for 15 comfortable shaves. Razor blade features sharper, Turbo cutting blades (first 2 blades vs. Sensor3). Long-lasting Comfort Gel Bar provides an incredible Glide. Microfin skin guard stretches the skin, and prepares hair to be cut. Fits with any Mach3 razor handles. 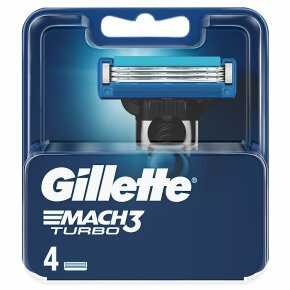 Gillette Mach3 Turbo men?s razor blade refills feature 3 stronger-than-steel blades that stay sharper longer (vs. Sensor3). With sharper, Turbo cutting blades (first 2 blades vs. Mach3), a Mach3 Turbo blade refill is engineered to last 15 comfortable shaves. These Gillette razors feature a long-lasting lubrication strip that provides an incredible glide. Mach3 Turbo has a microfin skin guard that stretches the skin, and prepares hair to be cut. Mach3 Turbo mens razor blade refills fit all Mach3 razors.